The only spider-proof shed on the web! OPTIONAL EXTRA - Impregnated peppermint, citrus and insecticide treatment. for that price, I think I'll live with the spiders. We have no poisonous ones here in Maine so I think I'll just let the spiders do their thing. Excellent design and craftsmanship. That Mr. Parker won't know what hit him! However, I was a little disappointed that the shed did not have a trapdoor pre-installed on the floor so I could build my secret subterranean lair. This shed is great! It will block 99.9999 for all spiders. On the one hand, I hate spiders. With a passion. So much so, that I've turned it into a career. From a professional point of view, this thing simply does not work. Really? Mint and the color blue? On the other hand, if it did, it would just send the spiders into your home, which is when I make the big bucks. Excellent product, I must say. This will come in handy when I need a broomstick shed. However my friend Hagrid, a great spider lover, hates how this very shed is spider proof, so I'm going to have to give it a rating of 1/5. After all the reviews below from Tiger Sheds themselves. I thought i would write an honest review. This is the most pointless shed i have EVER seen in my whole life. That is all. Completely useless! Was putting my tools away, left the door open and all the spiders wandered in. It turns out that spiders can't read and so ignored the 'No Spiders Allowed' sign on the door! I bought this shed in order to build and store my special effects equipment. It all started out really well and I was happy, until I tested one of my gas-producing gadgets! The airtight windows meant the gas didn't dissipate and it took me almost 2 days to find the door handle. 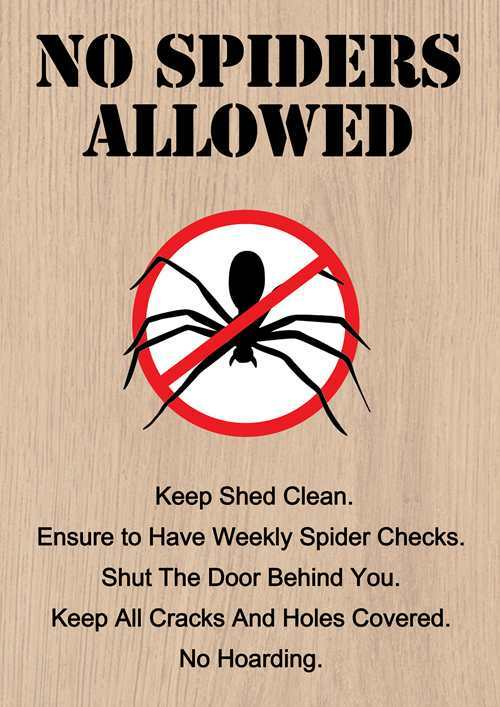 With 25% of the British public admitting they're too scared to venture into their sheds due to arachnophobia*, we decided to do something about it. That’s why here at Tiger Sheds we created the world’s first Spider Proof Shed. No longer will you fear grabbing your gardening tools or bustling for your bike; visit your shed with confidence with the Spider Proof Shed. 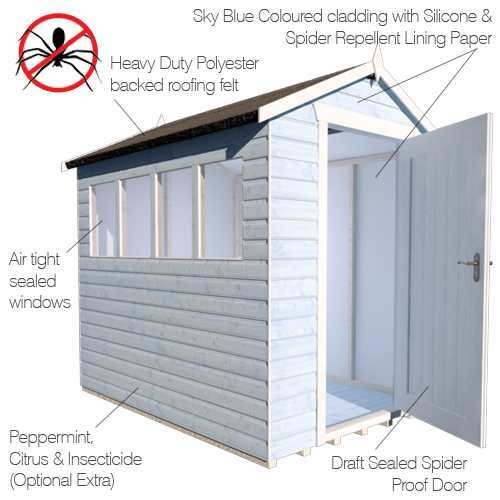 The Spider Proof Shed has been intelligently and carefully designed to repel spiders. 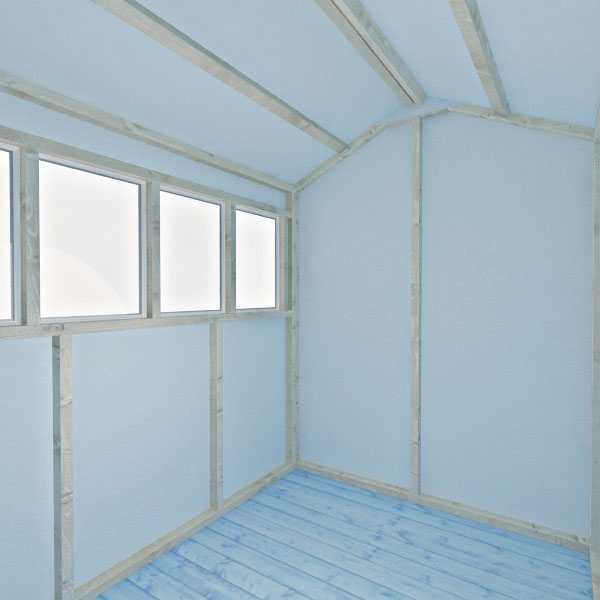 Unlike your standard Garden Shed, the whole space is air tight. 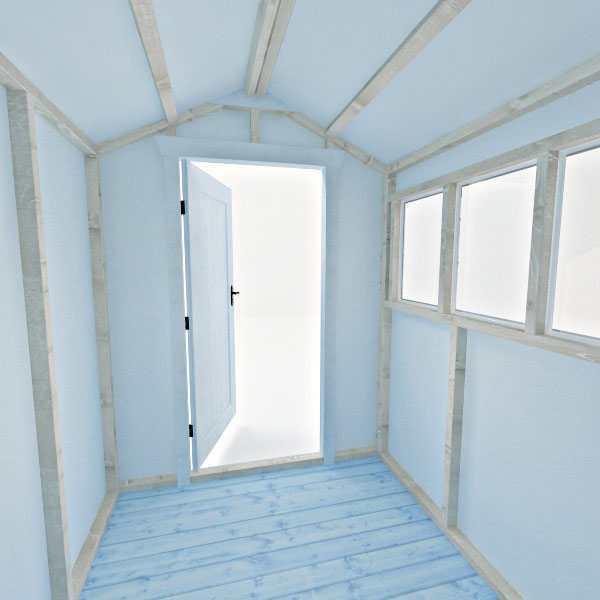 As we all know, spiders like to crawl their way through the smallest cracks and holes so we’ve taken extreme care to cover any potential areas that spiders can come through and we've even included a special air tight door seal. 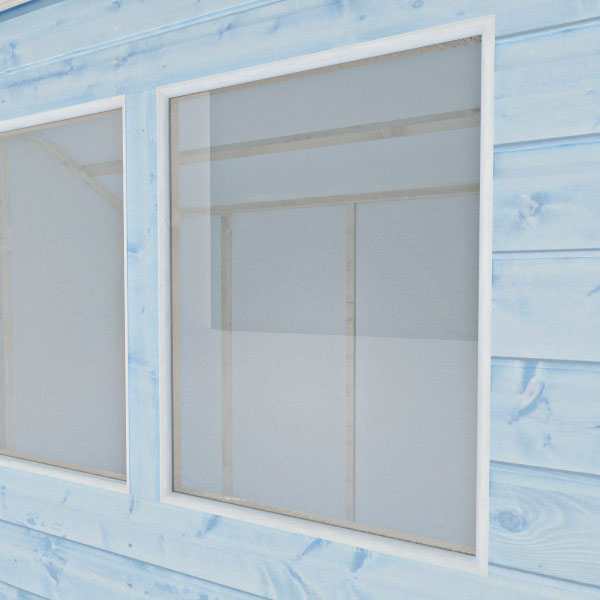 The windows are made from toughened glass and are completely sealed in to ensure the shed is water resistant and but spider proof too! 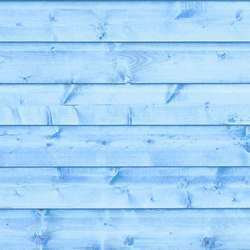 The shed comes with spider repellent lining paper in a sky blue colour, as this has been scientifically proven to help repel spiders. As an extra, why not upgrade your treatment so that that the wood is impregnated with peppermint, citrus and insecticide; all ingredients which spiders aren’t a big fan of. As an extra bonus, this will also result in your shed smelling fresh! 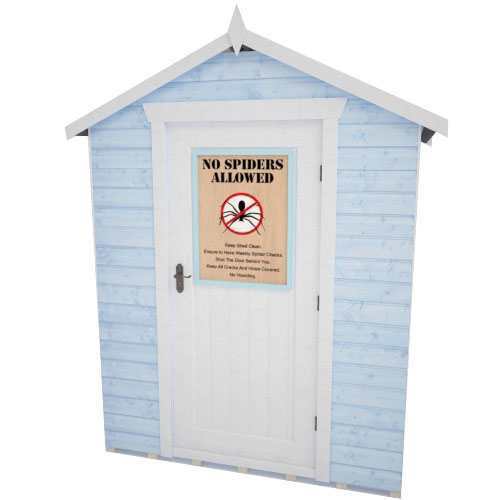 A novelty 'No Spiders Allowed' sign comes as standard, which makes the perfect decorative piece for your Spider Proof Shed and even has some useful tips on keeping your shed spider free! This will also let any visitors instantly know that they’re in a spider free zone. As an optional choice with this product you can include our ‘Creepy Crawley' den, which is a special home designed to attract spiders away from your much loved Garden Shed. 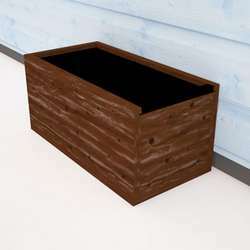 The Spider Home is a dark wooden box with holes for the spiders to crawl into. The inside of the box is painted black to make it even darker to attract them to stay in the Spider Home. 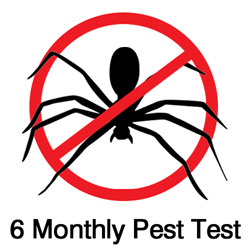 We’re confident that our product will meet your satisfaction but just to ease your spider worries why not add on the optional six-monthly pest test. This test will be conducted by a fully trained member of the Tiger Sheds team who will carefully inspect your Spider Proof Shed for any spiders. If we do find any, then these will be carefully removed and a full investigation will take place into how this may have occurred. Before building this product Tiger Sheds carried out extensive research to fully understand what repels spiders and what would attract them to their Spider Home. 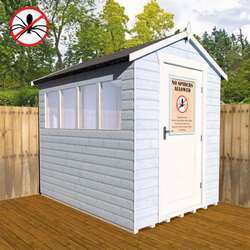 Therefore, this product is scientifically proven to be spider proof and is the perfect shed for anyone who has a fear of spiders and wishes to enter their shed in full confidence. * Omnibus survey of over 2,000 people (national representative sample) conducted in July 2015 on behalf of Tiger Sheds by research company, The Leadership Factor. To maintain the validity of this guarantee the product must be assembled strictly in accordance with the instructions supplied, treated annually with an appropriate high quality preservative and all glazing units must be sealed, inside and out, with silicone or other water tight sealant. For more information on how to correctly assemble and maintain your garden building please consult our comprehensive help centre. Please note: The anti-spider-infestation guarantee protects against the infestation of spiders (plural) into your garden building for a period of 7 consecutive days or more. To support a claim for spider breach we will require to be sent clear video footage of more than one single spider taking residence in your building for more than 7 consecutive days which will then be assessed by our in house team of arachnologists. Why not upgrade your treatment so that that the wood is impregnated with peppermint, citrus and insecticide; all ingredients which spiders aren’t a big fan of. As an extra bonus, this will also result in your shed smelling fresh! We’re confident that our product will meet your satisfaction but just to ease your spider worries why not add on the pest test to occur every six months. This test will be conducted by a fully trained member of the Tiger Sheds team who will carefully inspect your Spider Proof Shed for any spiders. If we do find any, then these will be carefully removed and a full investigation will take place into how this may have occurred. 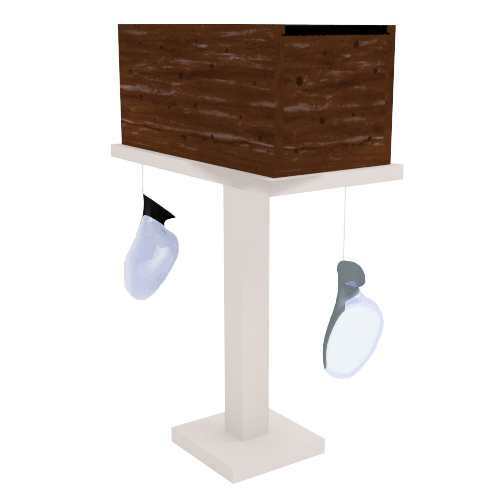 This special Spider Proof box is designed to attract spiders away from your much loved Garden Shed and into the box. The Spider Home is a dark wooden box with holes for the spiders to crawl into. The inside of the box is painted black to make it even darker to attract them to stay in the Spider Home.